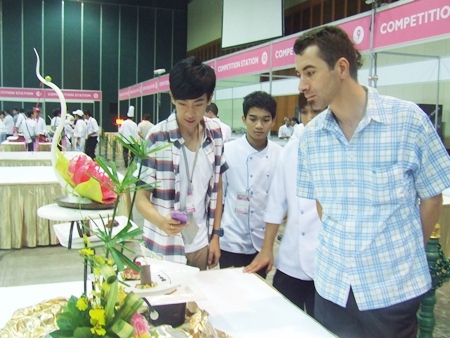 Top hotel chefs from 10 countries joined Thailand’s best culinary artists for the 5th Pattaya Food & Hoteliers Expo. 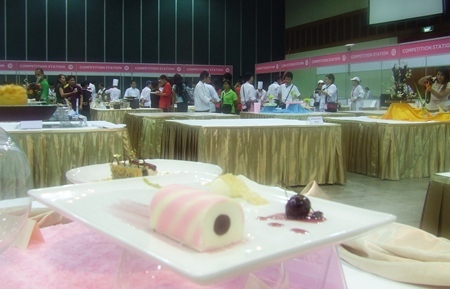 The Aug. 5-7 event at the Peach Convention Center in Jomtien Beach featured nearly 20 contests in everything from fruit carving and drink-mixing to deserts and Thai set menus and more than 800,000 baht in prizes. 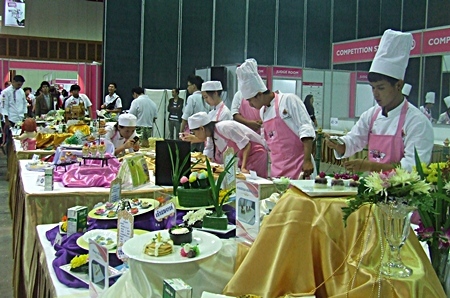 Cooking contests pitted professional chefs against each other and offered opportunities for rising university stars to try their hand at deserts, plate arrangement, Thai and European dishes, flower arranging and cocktail mixing. 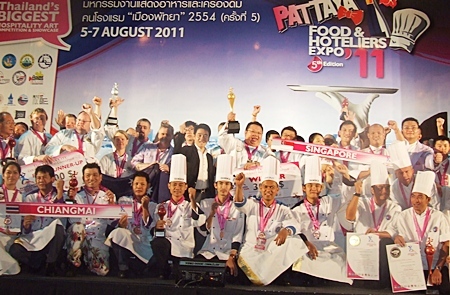 Winners of the international chefs competition from Singapore, Australia, Austria, Bangkok, Samui and Chiang Mai let out a cheer for all the fun their having. 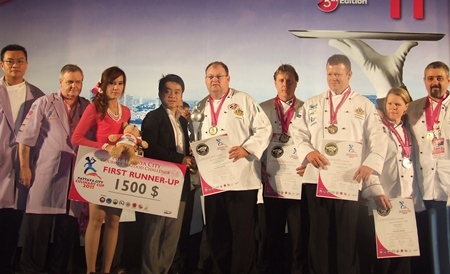 New to the show this year was an international chefs competition with 15 teams from Austria, Brazil, Czech Republic, Hong Kong, Indonesia, Malaysia, New Zealand, Singapore, South Korea and Taiwan squared off against Thai hotel teams from Bangkok, Pattaya, Phuket, Koh Samui, Chiang Mai, and Cha-am Hua Hin under the watchful gaze of the World Association of Chefs Societies. 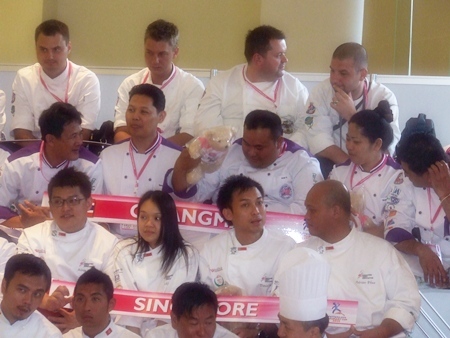 The team from Singapore took the gold medal, with Australia winning the silver and teams from Austria, Bangkok, Samui and Chiang Mai getting silver medals. 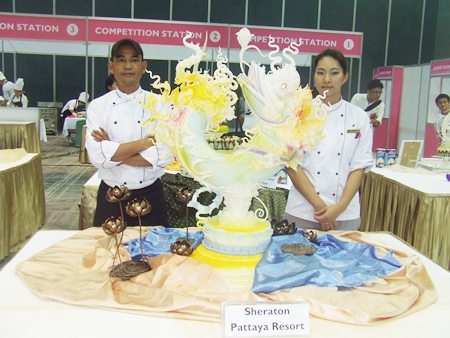 For the second year in a row, the Sheraton Pattaya Resort took top honors overall. 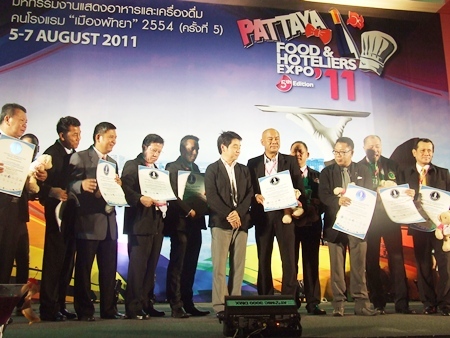 Chefs from Royal Cliff Beach Resort Pattaya pose for a photo at the Pattaya Food & Hoteliers Expo ‘2011. 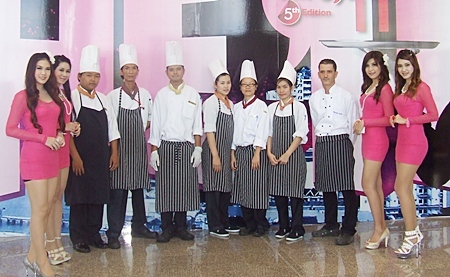 Among showcase competitions, the Amari Orchid Resort & Tower, Swiss Hotel Le Concorde Bangkok and Rat R Taiwan Hotel won gold medals in the European and Set Menu Cooking contest. 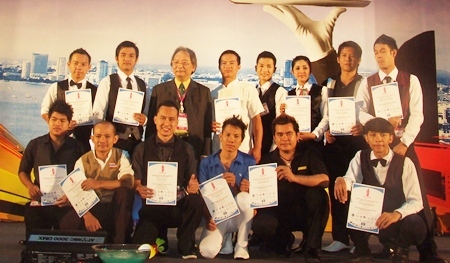 Pattaya’s Centara Grand Mirage Beach Resort and Holiday Inn won silver medals and the Sheraton won silver. In the Gala Setup competition, the Sheraton took first place, with Royal Cliff Hotels Group and Centara finishing second and third, respectively. 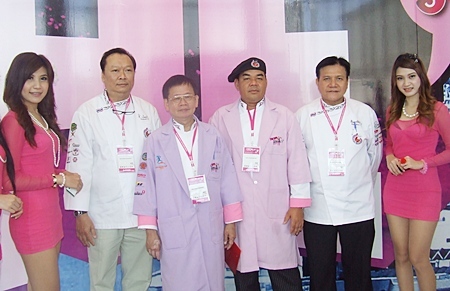 Sponsors and luminaries sit at one of the elegantly decorated tables. 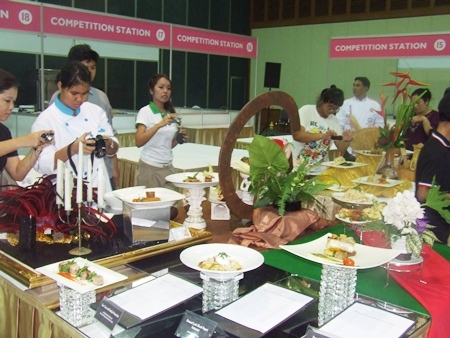 In the Junior Chef Culinary Team Challenge, one of two teams from Suan Dusit Ratchapat University won the Thai Fusion Food Plated Dessert event with Banglamung Vocational College and another Suan Dusit team finishing second and third, respectively. 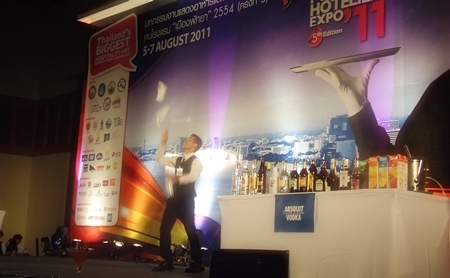 The event, sponsored by the Pattaya, Chonburi Province, the Tourism Authority of Thailand, Pattaya Chefs Association, Eastern Housemaid Administration Club, Thai Eastern Food Administrators and Beverage Association, was also a venue for more business representatives to hawk food and beverage products, tools, equipment and household items used in the hotel and restaurant industries. 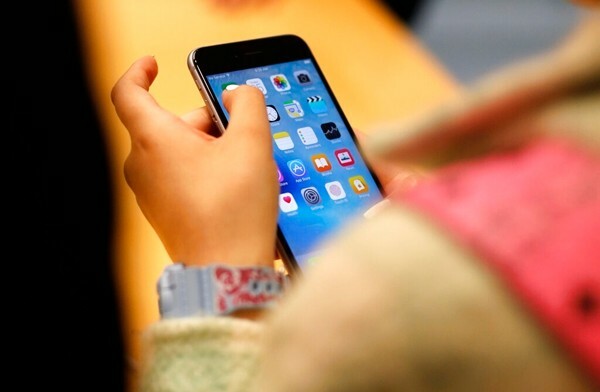 Artists create masterpieces out of fruit and vegetables. 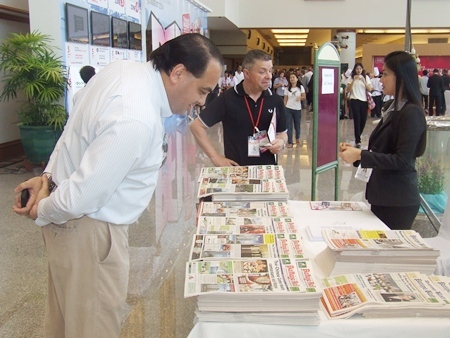 Guests pour over the latest edition of the Pattaya Mail at our booth during the expo.